Carnegie Public Library hosted its first ever Adult Spelling Bee on Friday evening at Two Scoops of Sugar. Among other words, the brave contestants tackled quixotic, raconteur, onomatopoeia, and Buena Vista. Winner Wendy Smalley took home a Scrabble Crossword Game and honorary certificate. Smalley (left) is pictured with Carnegie Public Library Director Sarah Nichols. 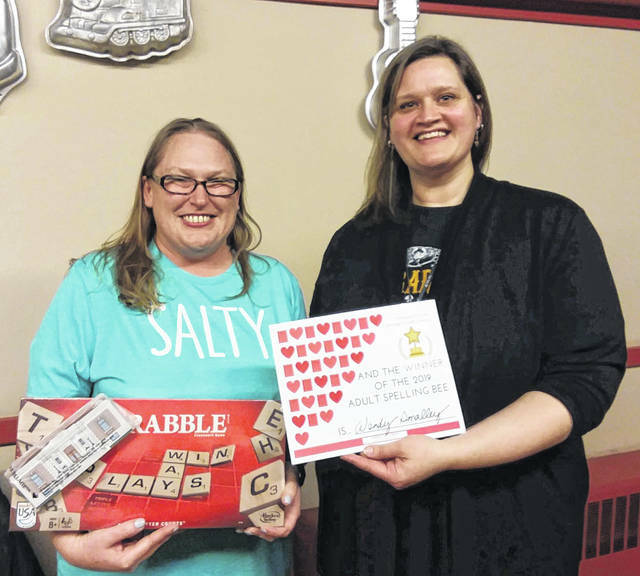 https://www.recordherald.com/wp-content/uploads/sites/27/2019/02/web1_20190208_193939-1.jpgCarnegie Public Library hosted its first ever Adult Spelling Bee on Friday evening at Two Scoops of Sugar. Among other words, the brave contestants tackled quixotic, raconteur, onomatopoeia, and Buena Vista. Winner Wendy Smalley took home a Scrabble Crossword Game and honorary certificate. Smalley (left) is pictured with Carnegie Public Library Director Sarah Nichols.